Some business enterprises become inextricably woven into a community’s fabric, able to remain anchored during turbulent commercial times when dreams open storefronts and market forces shutter them. Signcraft is not only solidly in that category, but has also served clients with roots firmly planted in Annapolis’ maritime-steeped soil: Rams Head, McGarvey’s, Historic Inns of Annapolis, St. John’s College, US Naval Academy, and other equally storied institutions and enterprises. In a world of digital-on-demand services, Signcraft has adapted by placing one foot in the new world while holding fast to its heritage in traditional art and graphic design. Owner John Prehn launched the business in 1980, out of the basement of his home in downtown Annapolis. He got his start in the sign business in the 1970s, working with Annapolis Graphics. When he asked the owner to give him a percentage of the business, the owner declined and so Prehn struck out on his own. Over time, he moved the business into a friend’s garage in Eastport. Annapolis was a smaller town then, and competition from sign franchises hadn’t yet blipped onto the radar. It wasn’t long before people in America’s Sailing Capital learned of Prehn’s steady hand, a necessity for the careful hand-lettering he was doing on boats. He did other work raround town, including for shops and proprietors stationed along downtown’s historic destination thoroughfare, Main Street, traveling from job to job with paint brushes and paints in tow. The niche Prehn has created is a melding of classic graphic arts with the razzle-dazzle elements of computer-based design. 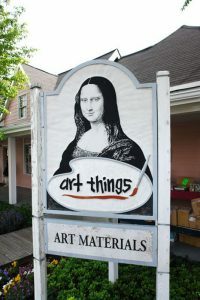 While some relics of the trade, such as silkscreen machines, paints, and squeegees, have been removed from the current warehouse location in Annapolis to make way for digital printers, computer stations, and vinyl plotters, craftsmanship is a mainstay. The market favors traditional design and art over products churned out in five minutes, along with accuracy, timeliness, and attention to customer needs. Signcraft boasts an artisan of its very own—Tony Thamasangvarn—who has a studio on site. Thamasangvarn joined Prehn 30 years ago and brings artistic versatility to Signcraft’s offerings. He can do anything, from sculptures and portraiture to vignettes and animal likenesses such as foxes and herons. At one time, prior to digital prints fulfilling such orders, he was hand-painting banners such as those of the 50-foot variety that hang along overpasses for big-name clients like Northrop Grumman and Westinghouse. Tim Cook, Prehn’s stepson, acknowledges that they have a creative edge over their competition. “We lean toward things like carving, stone work, metal work, bronze casting, [and] sculpture, and also do a lot of industrial-type graphic design. But the prevailing thing is deeper and has a more historical side to it—[with] techniques such as gold leaf and gilding.” Signcraft does a lot of work for the US Naval Academy, fulfilling orders in keeping with the institution’s classic style. “They do things [that] are timeless, so our work has to be the same caliber,” says Cook. A few years back, Signcraft made several sculptures for the USNA, including a full-cast bronze of the 15-foot Navy goat now located in the Naval Stadium. Other commissions are scattered throughout the academy, including a bronze bust of Charles Larson, a former Navy Admiral, and the dedication plaques for the Academy’s Larson Hall. Cook notes that computers have changed output. “It saves some time, and you can make things bigger, faster. I can order a digital print for a 40-story building, and it shows up the next week.” He joined the business about 20 years ago, after graduating from college and traveling before returning to Annapolis. He decided that graphic design was a good business, and if he was going to work for someone, he may as well help build the family’s business rather than someone else’s. “I appreciated what was before me and committed to it,” he says. 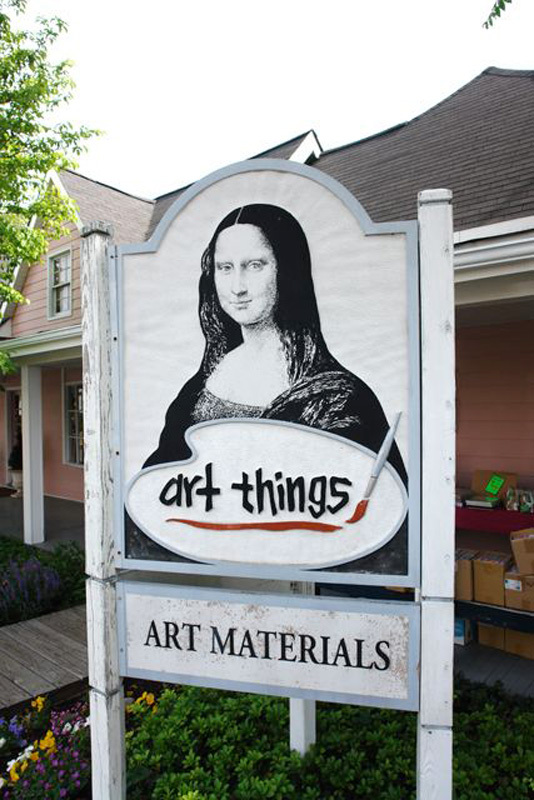 There’s an art behind the creation of a sign that grabs and communicates with someone. Cook believes that, in graphic design, you should get the main point across immediately, in a unique and tasteful way, so it doesn’t need much time to figure out what it’s for and what it means—“not full of chaos and extra things,” he explains. Cook finds that Annapolitans appreciate quality, recognizing that it pays dividends over the long term. When given a choice, Signcraft tends to opt for high-end materials. “We don’t try to upsell them, but let them know the value and know what the differences are.” This is in keeping with the company’s focus on providing quality work and materials that reflect an artisan at work. Certain minor techniques accomplish this—master touches that the layperson may not notice, such as putting metal edges on the tops of signs for an established business, using metal instead of plastics for optimal wear, and using better-quality paints. Error: Error validating access token: Session has expired on Saturday, 09-Mar-19 15:57:50 PST. The current time is Tuesday, 23-Apr-19 08:56:55 PDT.